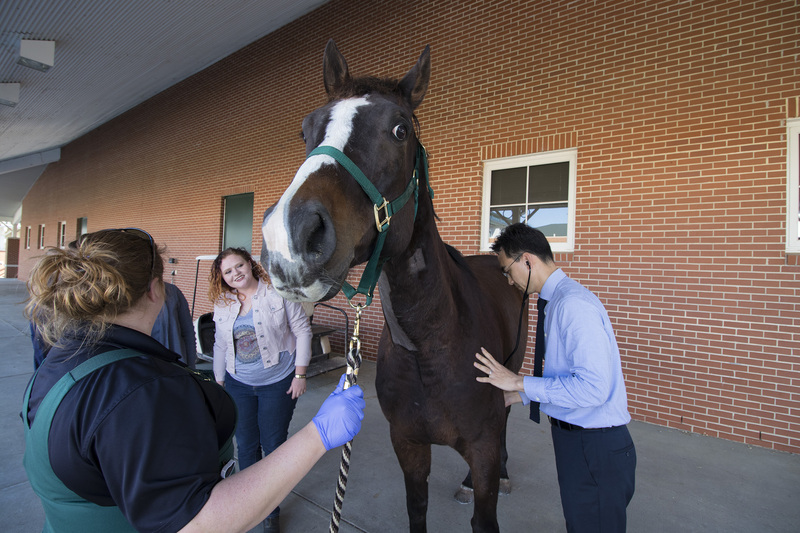 Moissanite’s owner, Katlynn Cross, center, looks on as Dr. SeungWoo Jung examines the horse before his discharge as an AFib patient at the Auburn University College of Veterinary Medicine. Holding the reign is Equine Medicine Technician Julie Watts. Veterinarians at the Auburn University College of Veterinary Medicine have successfully conducted their first-ever procedure to correct atrial fibrillation in an equine patient, being one of only a handful of veterinary schools nationwide able to perform the procedure. Both the medical team and horse owner are excited about the results. The procedure on Moissanite, a 6-year-old thoroughbred jumping horse, involved a team of large and small animal faculty veterinarians and technicians from cardiology, equine medicine, anesthesia and radiology services in the Veterinary Teaching Hospital. Atrial fibrillation—commonly known as AFib—occurs in humans and large animals, says Dr. Seung-Woo Jung, an assistant professor of cardiology in the Department of Clinical Sciences who sees both large and small animal cases. “A true veterinary team effort was put together to conduct this procedure, and because it was the first time we have conducted a TVEC [transvenous electrical cardioversion] procedure on a horse, it provided a wonderful educational opportunity for our staff and veterinary students,” Dr. Jung said. AFib is an arrhythmia with an irregular and often rapid heart rate that can increase the risk of stroke, heart failure and other heart-related complications. A normally beating heart contracts and relaxes to a regular beat. In AFib, the upper chambers of the heart—the atria—do not contract, which results in a decrease in blood volume pumped from the heart to the rest of the body. 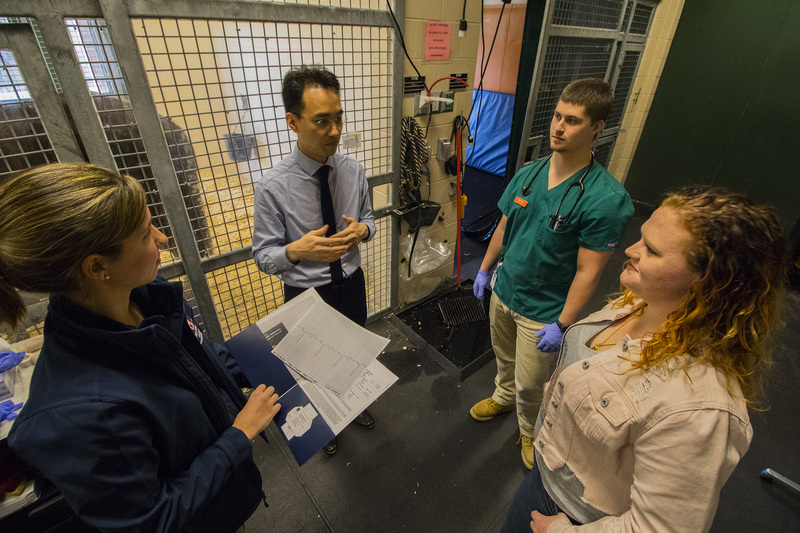 Dr. SeungWoo Jung, center, talks with his veterinary medicine team members and Moissanite’s owner about the case. Shown from left are Dr. Tamara Sierra, equine medicine resident; Ryan Green, fourth-year veterinary student; and the horse’s owner, Katlynn Cross. Moissanite was diagnosed by his primary veterinarians, Drs. Charlene Cook and Lauren Shamon with Central Georgia Equine Services in Fort Valley, Georgia. The thoroughbred was admitted to Auburn on March 5 and underwent the TVEC procedure. After remaining under observation as an ICU patient overnight, Moissanite was re-examined and discharged to her owner on March 7. Cross says she plans to return Moissanite to his jumping career soon.